As CX is now having more lounges with a la carte menus, this is a thread to post the menus as they change. If you have any other menus that you have taken photos of, please post in this thread stating which lounge, and which month the menu is from. Courtesy of Rami Tamimi - Hong Kong Pier F October 2016. Menu looks like it's been reduced since it first opened... I remember they had some interesting stuff a few months ago, like baked rice, hot pots rice, more soup options, etc.. It certainly has. Check out my pics of the first edition of The Pier's menu,taken 3 days after opening. They now have it in small jars in the pantry. That's the first room I would go every time, grab a bottle of mini evian so I don't need to ask for water in the restaurant. Forget starters and entree's this month in the Pier.Just go straight to desert and the Chocolate pudding. It is devine. If I didn't have to run for flight I would have gladly had two. Seriously though don't have picture but new things this month I remember. Fungus salad, salmon starter, Halibut entree (pretty decent), duck entree which looked quite nice. That is all I remember. But yes chocolate pudding, you will not regret it! Best desert on the menu in months and probaly ever! Love the new LHR F lounge. 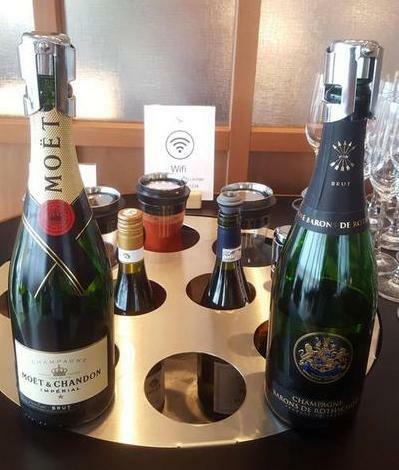 The only downside for me was the old lounge offered Veuve Clicquot and now they offer Moet. and now they offer Moet. The Barons de Rothschild is excellent, a class apart from Veuve!